We at Rock Structure Repair know the frustrations when you start to see issues with your home. Are you noticing cracked walls, doors sticking, cracked brick or block walls outside or even cracks in the foundation? All of these are common warning signs that you might need your foundation repaired. Whatever the cause of your home’s foundation problems, Rock Structure Repair has the solution – our DynaPiers! We use an advanced system that was designed to be the strongest foundation pier in the industry by combining steel and high strength concrete. 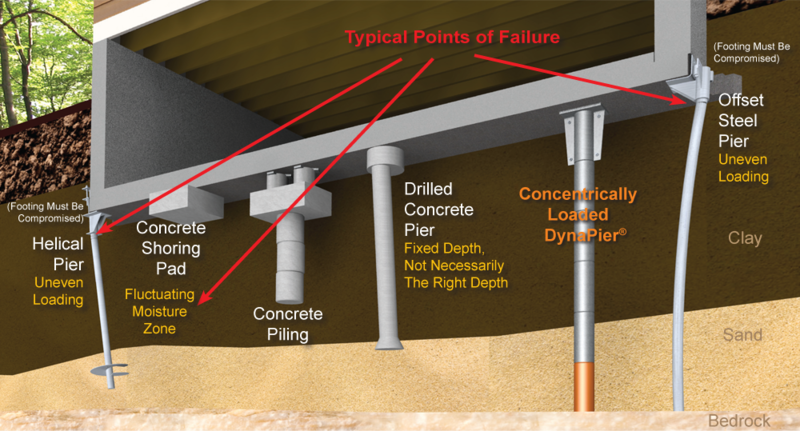 It is installed centrally beneath the footing rather than outside of the footing, thus transferring the structural load directly on top of the foundation pier. The DynaPier will achieve the greatest support. No other piering system can make these claims! The pier is located centrally and directly beneath the foundation footing. ALL parts are connected to form a monolithic unit. ALL shims are contained within the pier cap. Installation does not require removal or breaking of the footing; footing remains completely intact. Rock Structure Repair conducts a thorough inspection of your home and we’ll let you know exactly what steps need to be taken to permanently stabilize your foundation and restore value to your greatest investment.